I remember my very first attempt at home brewing. I’m talking about extract, I’m not counting Mr. Beer. I thought I had everything that I needed. However, I didn’t get through a quarter of the process before the recipe instructions called for something that I didn’t have. It wanted me to make sure that the temperature of the water reached a certain point before I added steeping grains (grains used to add flavor and body to the beer). I didn’t have time to run to the store to pick one up, so I just kind of winged it and guessed my way through the process. Luckily, that IPA turned out amazing. However, I was playing a dangerous game with my homebrew. There’s two times when you’re going to need a thermometer. When you’re steeping the grains and right before you pitch (add) the yeast to your wort in the fermenter. If you add the grains and the water is too cool, you may not get as much flavor and body out of the grains that the recipe calls for. If it it’s too hot, it can produce some off flavors. If you pitch the yeast and the wort is too hot, it could kill off the yeast. Even if it doesn’t kill the yeast, it could produce some off flavors. If the wort is too cold, it could could inhibit the yeast from working until the wort warms up. 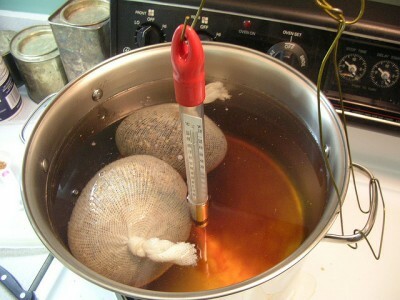 Good recipes will give you a temperature range for steeping the grains and pitching the yeast. What thermometer should I get? There’s three kind of thermometers that are popular for beginning brewers. Once you get going you may want to invest in one that’s higher end and more expensive, but for someone that’s brewing extract you don’t need to spend a lot of money. I’ve seen a lot of high quality ones that will get the job done for less than twenty dollars. I recommend getting a digital one. They’re easy to read and will give you an exact temperature. Also, popular with homebrewers is floating thermometers. They’re good because you can stick it directly in the wort and it’ll give you the temperature that you need. I don’t recommend a dial one. That’s what I started off with, but it was often hard to read and in general a pain to use. Since I got my digital thermometer, I haven’t looked back. A couple things to think about when your shopping. There’s thermometers that will give you instant results, while others will take a little bit of time. Also, look for one that will give you temperatures between at least 60 and 212 degrees Fahrenheit. Do you have a thermometer that you would recommend to other homebrewers?